Mummers Plays are seasonal folk plays performed by troupes of actors known as mummers. They are sometimes performed in the street but more usually as house-to-house visits and in public houses. The Lympstone Mummers will bring our Village’s traditional Mummers Play to Lympstone’s hostelries usually on the Saturday before Christmas. The script, handed down over generations, compresses a history of England’s hostilities – from the Crusades onwards – into a noisy ten minutes of violent defeat and rude revival of past foes. Father Christmas, in traditional green regalia, bursts into an inn (which shall be nameless) in North Topsham. “In comes I, Old Father Christmas!” Young reveller: “You brought me a present then?” The old gentleman, interrupting the hallowed script: “No, mate, sorry.” Young reveller: “Well, naff off out again, then!” A little later, in the same jovial hostelry, King George cries “Who will fight me, hand to hand?” and a queue of willing volunteers set about disarming him. But they still clapped and cheered at the end. As did you, Lympstone. 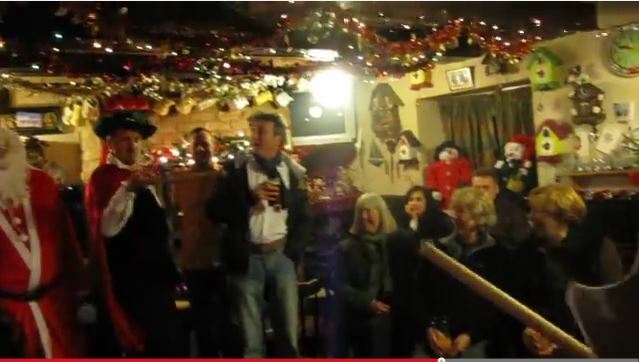 Thank you for that, from all the Mummers, who enjoyed themselves as never before around the village pubs on the 23rd. Thank you too, good folk of Topsham and Lympstone, for swelling our collection for the Children’s Society to the tune of £330.